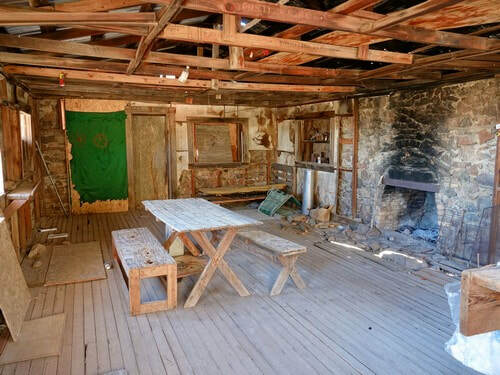 Visit a remote old silver mine with a well preserved stone cabin. Also concrete foundations and several not so well preserved cabins. This is a short trail that is a long way from anywhere - along the south part of Alamo Road. 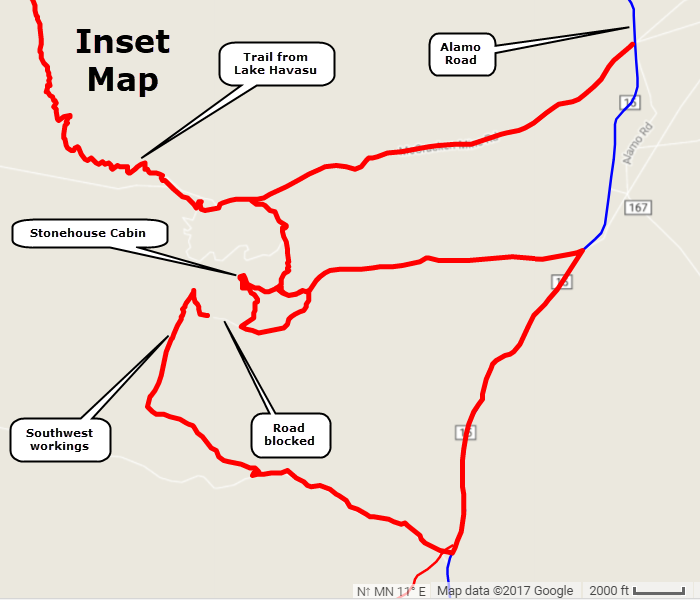 It can be reached from Parker via Planet Ranch to Alamo Road 2.5, and from Lake Havasu via the Alamo Road or via the trail described here. 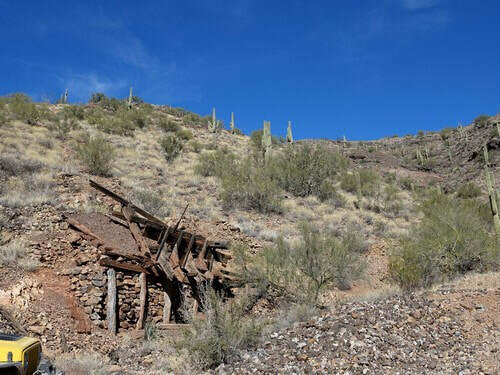 ​McCracken Mine was discovered in 1874 by Jackson McCrackin and “Chloride Jack” Owen, for whom the Owen Mining District was named. The rich silver lode comprised a 9,000 foot ledge in some cases carrying 18 inches thick horn silver (chlorargyrite), a silver ore exposed to the environment taking on the dull luster of a cow horn. 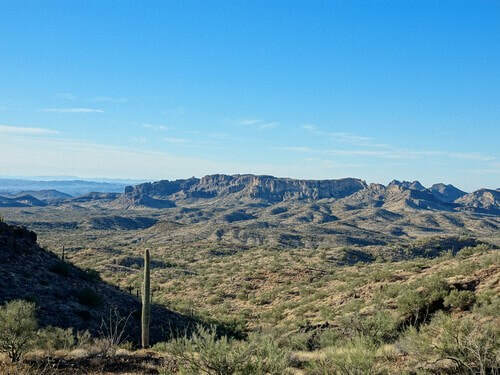 ​The mine includes 9,000 feet of tunnels and drifts, and a 600-foot deep shaft. 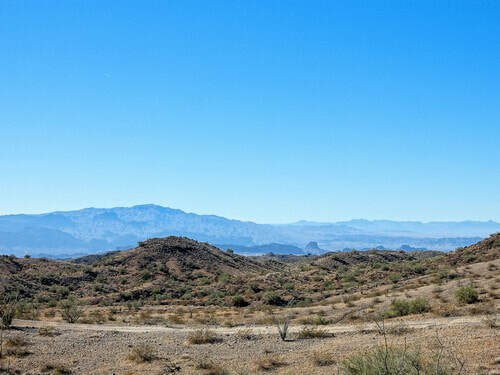 This route is described starting in Standard Wash south of Lake Havasu City. 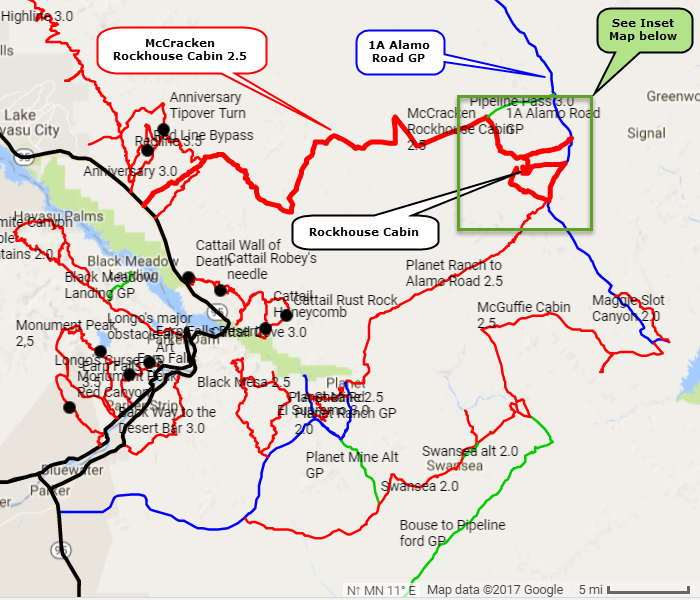 You will travel up Standard Wash, down West Mohave Wash, up Mohave Wash and then out across Dutch Flat to the McCracken Mountains. ​The first part of the trip is mostly in washes, except for a short stretch over a height of land between Standard and West Mohave Washes. 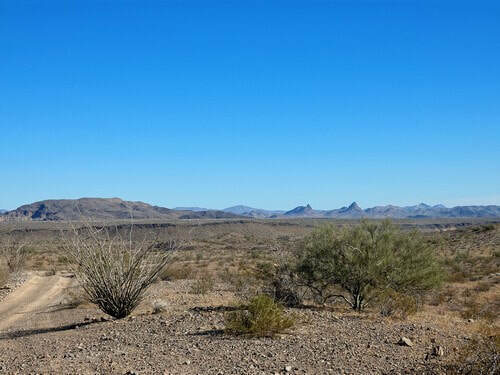 This height of land offers nice views in each direction. The washes are broad with numerous driveable threads that move with every heavy rain. 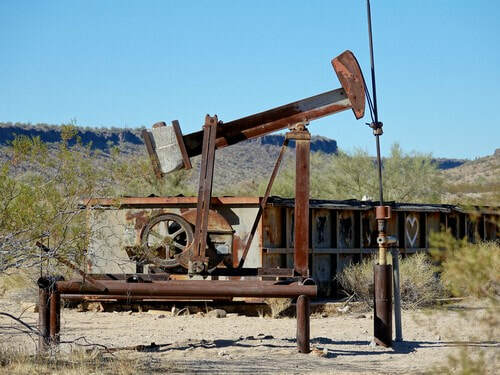 Do not worry too much about following the exact track - just stay in the wash and you will be OK.
​There is an interesting pump on the west side of Mohave Wash.
One of the first things you see as you approach McCracken Peak is the foundation of an old 20-stamp mill that operated in the late 1800s (we think). 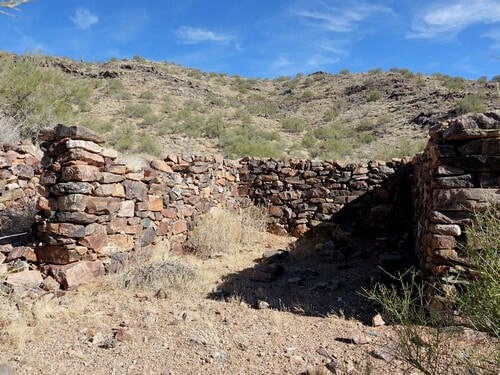 The Arizona Daily Star has a great article detailing the history of McCracken Mine. Inactive since 1985, the mine was remediated in 2008 by Teck Resources Ltd. 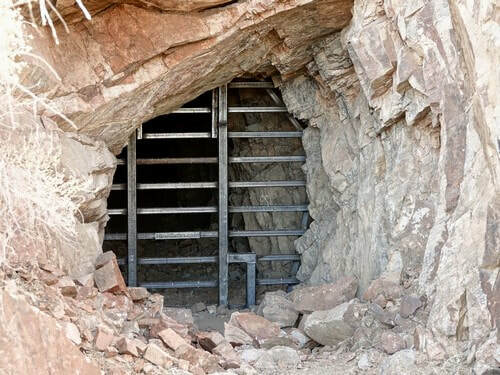 It sealed 47 mine openings with backfill, polyurethane foam and gate closures, and provided nine bat-compatible gates for the purpose of bat habitat preservation. ​Continue along the track and come to Rockhouse Cabin. 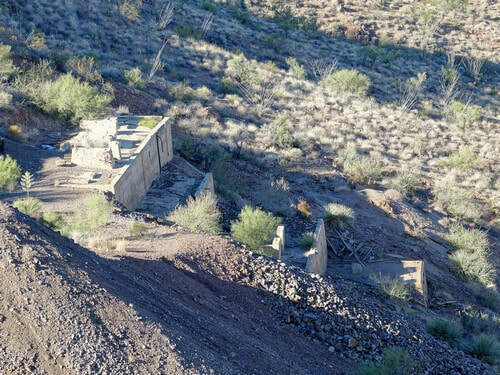 The above article claims this was a boarding house for miners. A mine directly behind Rockhouse Cabin has been sealed with a bat friendly closure. There is another foundation below the cabin. 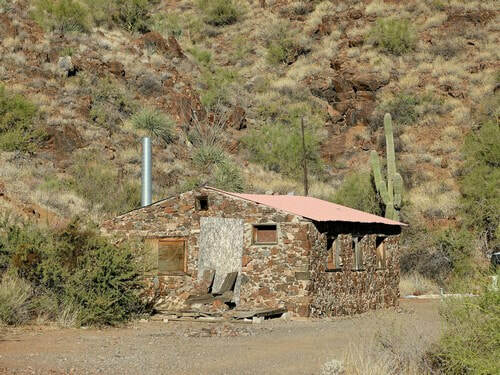 Prior to remediation it was possible to drive directly from the cabin to workings and foundations on the southwest side of the mountain. That road is now blocked at a closed mine shaft. 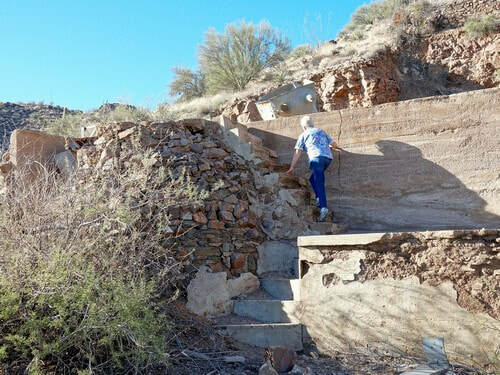 We could see where some people had ignored the no trespassing signs and driven over berms to follow the old road, but that is certainly not acceptable. Please go to Alamo Road and take the long (legal) way around. The southwest area must have been something in its day. 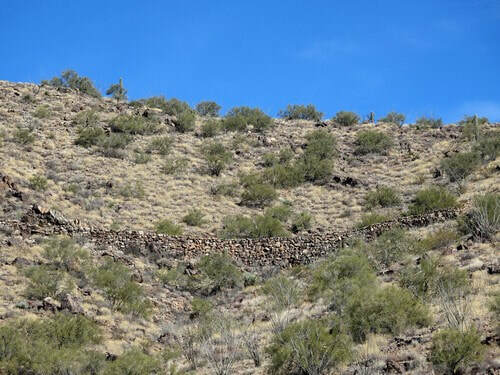 There are remains of numerous stone buildings, an ore chute and long stretches of stone retaining walls for mining roads. The trail to the southwest area is used very little and is quite brushy. Expect some Arizona pinstriping. 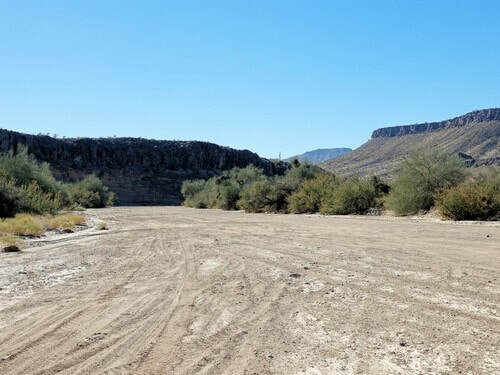 Visitors from Lake Havasu may want to return via Alamo Road. It is longer, but much easier and quicker. Those from Parker can return via Planet Ranch to Alamo Road 2.5 or McGuffie Cabin 2.5.